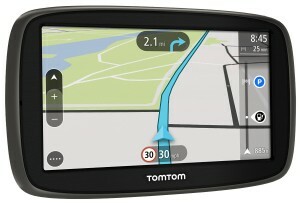 The TomTom Go 50 is a 5-inch satnav that’s preloaded with maps for the entire of Europe, and has TomTom’s most recent interface. The Go 50 itself is well built and the mounting bracket provides for a superior adjustment and a solid grip on your windscreen. The sat nav has a battery life of up to two hours which is charged through the base unit. It is pretty easy to set up this sat nav. All you have to do is to make a language and country selection and proceed to check out the tutorial that pops up. In case you don’t wish to view the tutorial, then you can skip it. After the set up, you will be on your way to utilising your sat nav unit! 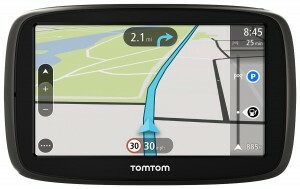 The TomTom Go 50’s screen is a resistive touch screen much like any other dedicated sat navs. It comprises of a matt finish which translates to little or no glare or reflection, although there is a need to firmly press the screen in case you wish to get response. While this may not be such a big deal, when compared to a number of smartphones, the keyboard does feel a little cramped and is a lot less accurate. This means that you may have to slow down and deliberately press a key at a time. There are plenty of options on the menu system, although, there may be a need to navigate through them with your finger considering that they are not all displayed on a single screen. For the life of your product, you can receive TomTom Traffic updates and download 4 or more full updates of your pre-installed map every year. In order to make this happen however, you will need to make use of a PC with an Internet connection, in addition to a MyTomTom account if you wish to download map updates. 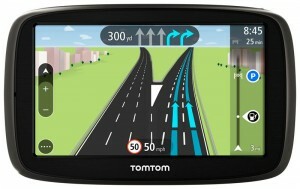 It is also advisable to constantly connect your device to your My TomTom account in case you wish to receive the latest features in the FREE software updates. The Text-to-speech voice guidance and voice prompts enables you focus your eyes on the road as you drive to your destination. The Voice prompts present on this sat nav are clear and timely, although they may be sometimes overly detailed. With regards to traffic updates, you can get real-time traffic updates to help you avoid delays thanks to the lifetime TomTom Traffic that comes with the sat nav. There are 3D maps available that facilitate the viewing of landmarks and buildings in spectacular 3D detail. The Advanced Lane Guidance feature on the other hand shows you in advance which way to go while the integrated battery that comes with this sat nav unit boasts of a 2 hour battery life. Alternate travel directions can be provided thanks to the Automatic rerouting feature that comes with this device. This feature is especially important in the event of a digression from the directions given.